Back in 1965, I walked to downtown Anchorage to film the Fur Rendezvous parade and other Rondy activities with my new 8mm film camera. I was attending East high school and had decided that I wanted to study cinematography after I graduated in 1966. That year, Michael Landon, the actor who played Little Joe on the Bonanza television series, was the Rondy Parade Grand Marshall. As you will see in the footage that follows, I was able to get a good shot of Landon as he rode his horse in the parade. It was a very cold day and you can tell by how you can see everyone's breath. The cold must have been a bit of a shock to Michael Landon who lived in Southern California. 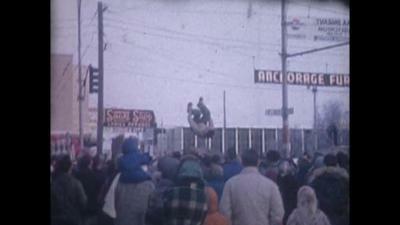 As you watch the footage, if you lived in Anchorage in 1965, and you, your family or friends were on 4th Avenue enjoying the Rondy, be sure to look at the footage to see if you can spot yourself, family members or someone you know. It's also fun to see the old cars and the shops from 1965. While shooting the film I felt a little funny with my tiny camera and tripod as I set up next to professional cinematographers with their pro equipment. Oh well, you have to start somewhere. I also learned how to shoot movie film in very cold weather. Anchorage's Fun Rendezvous is a colorful event featuring amazing and unique sites. People everywhere are having fun and enjoying something completely different after a long, cold Alaskan winter. I was in the East High band and marched in several Rondy Parades. In fact, I wrote a story about it titled Marching in the Fur Rondy Parade which you can read right here. 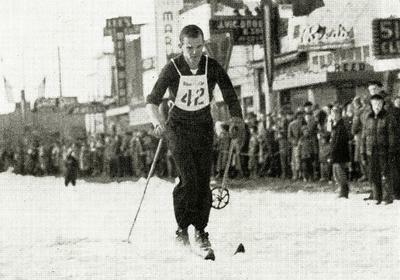 In the film footage included in this story, you'll see the Blanket Toss, parade, Michael Landon, and the sled dog races. My family first arrived in Anchorage in 1950, so I have enjoyed a lot of Fur Rendezvous. So it was a real pleasure to capture at least a bit of Fur Rondy history by shooting this film. Some years later in the 1970's I found myself behind a color television camera on top of a truck on 4th Avenue covering the Rondy Parade live on KTVA channel 11. Oh, and by the way, I went on to win an Emmy award for my camera work in 1980, just 15 years after I shot this footage. Who'd a thunk it? Check out this Anchorage teen's Michael Landon story right now. I loved seeing your Rondy footage. It brings back many happy memories of 36 years of my life. I miss Alaska a lot. Thank you for a touch of home. Thank you for your kind words about the film footage of the Fur Rendezvous that Mike shot back in 1965. We're glad that this story and the film brought back happy memories for you. That's what our website, Anchorage Memories.com is all about. "Wonderful Anchorage Alaska memories that fill your heart and feed your soul"
Reading your story was so much fun for me. Thank you for bringing back so many wonderful memories with your super 8 film footage. I love Anchorage and now because of you we can share our hometown with our two lovely granddaughters and grand nieces and nephews. Celebrating the day you won your Emmy Award was just a super day. And it all started way back when in our little town of Anchorage, Alaska.